Often in the course of conducting research, it is helpful for investigators to obtain information about current practice patterns, values, or other issues and opinions from physicians. 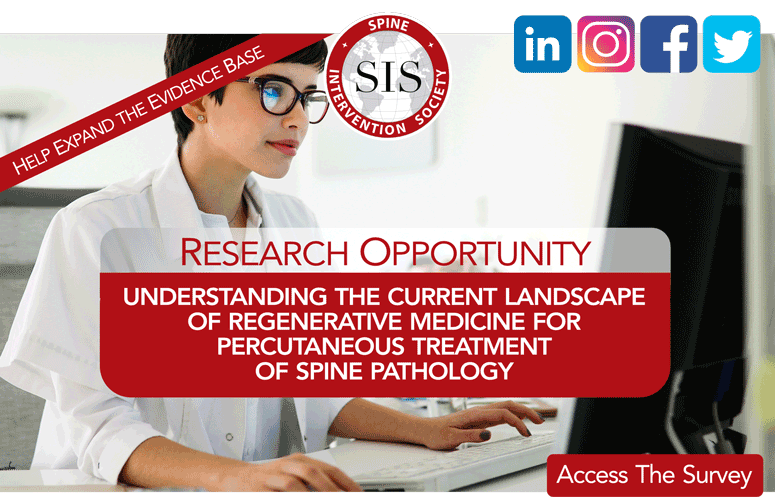 The Research Division of the Spine Intervention Society has reviewed and approved dissemination of the following survey to Society members. The following survey is designed to learn about preferred techniques for regenerative medicine (i.e., platelet rich plasma, bone marrow aspirate, etc.) for spinal pathologies and how they are used. Results of this study will help us better understand the current utilization of these therapies in clinical practice as minimal data exists to describe the modern use of these technologies in our field. By completing the survey, you are agreeing to participate in this research study. Possible discomforts or risks include loss of confidentiality if you disclose your contact information by answering the optional final survey question. Every effort will be made to protect your privacy and confidentiality by destroying your contact information immediately after you are contacted for further information. The survey is expected to take 3 minutes. If your research would benefit from survey of SIS members, click here for details.